it's time for studio calico reveal of bluegrass farm! presales has started for subscribers and all kits will be on sale for everyone tonight at midnight EST/ 11pm CST. i'm excited to share my projects made with studio calico main scrapbook kit, bessie (add on 1), clover (add on 2) and pip (add on 3). i made 5 layouts these month! to see detail shots and what products i used, you can click on each of the layouts. another beautiful cut file designed by paige evans this month! I hand cut the patterned paper petals and used them to cover the top left and bottom right of the page. you could also create a die file with the petals and cut them with the silhouette cameo. I left the rest of the petals empty to leave some white space for the photo and title. love the tone on tone effect of the cut file on the white background. i also used the foam tabs to create a slightly dimensional effect. 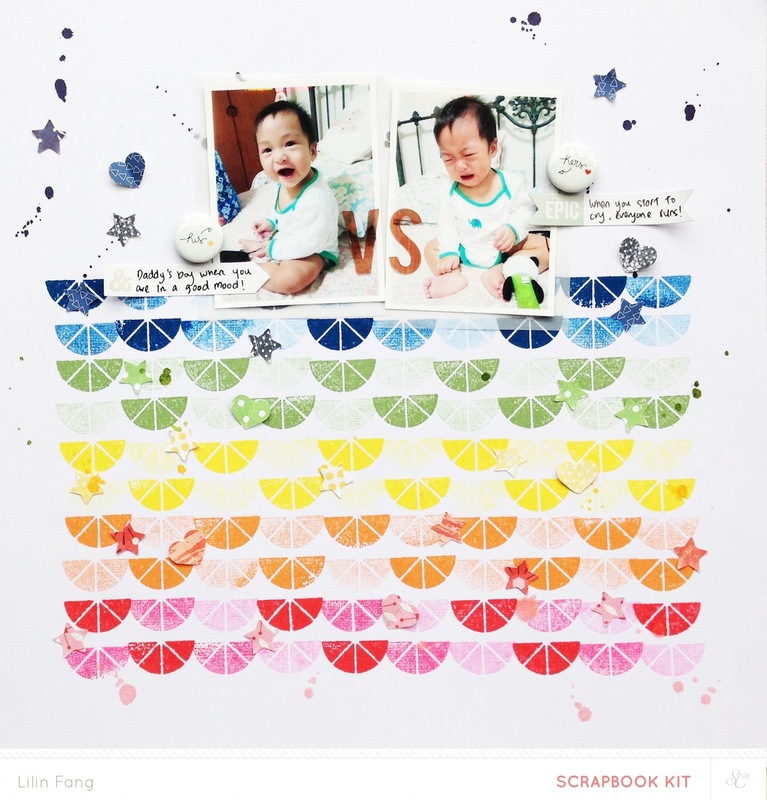 when i saw the stamp set in the main kit, i thought of using the semi circle stamp to create a background filled with colorful scallop banner. i choose to work with my colour theory inks in deja blue, yes peas, sunny day, orange country and well red. to create a ombre effect, i stamped the image 2 or 3 times before re-coloring the stamp. to add more interest to the stamped banner, i punched little hearts and stars from the patterned papers and added some ink splatters with mister huey mist in navy, mistletoe, double yellow and mary mary. 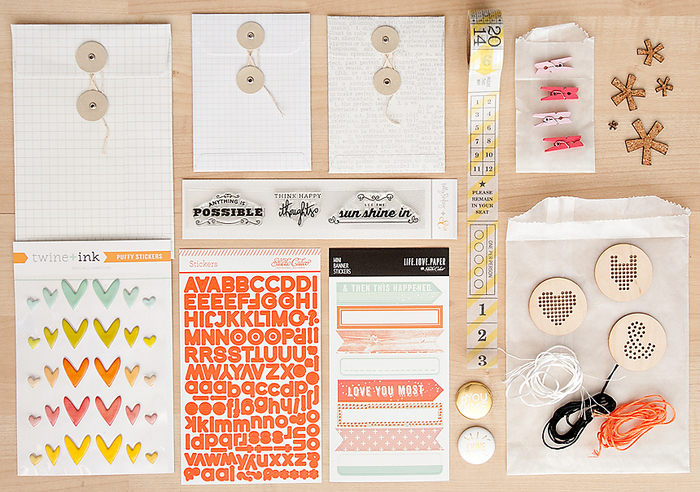 i also love the labels designed by hello forever to help me include my journaling. 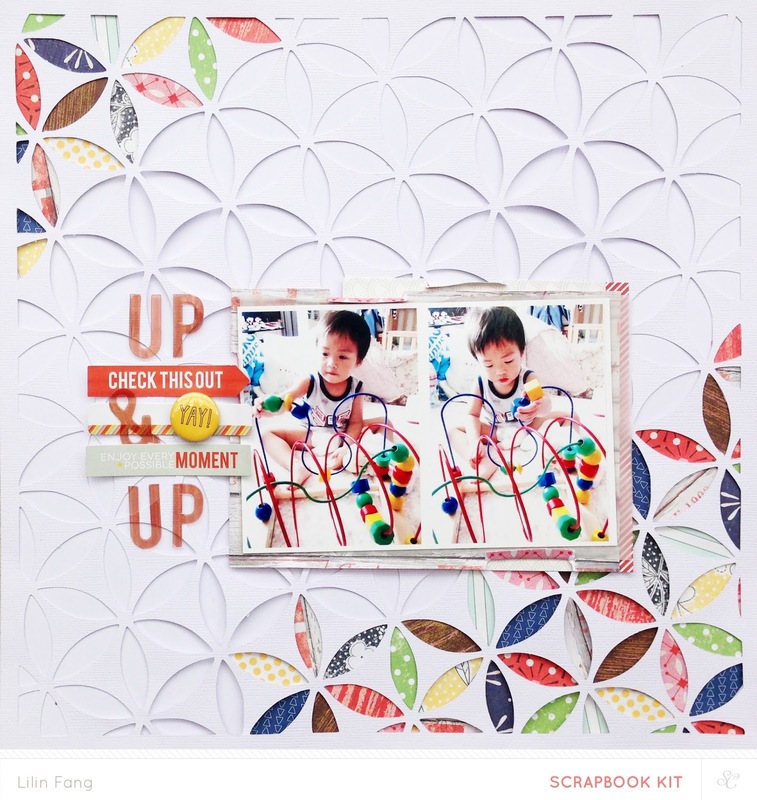 i love all the patterned papers from the main kit so to display all of them, i made this simple layout by cutting strips of the papers and arranging them around my photo. Love the stitchable wood veneer, wooden tag which I used for my title and the slim washi tape by amy tangerine. i finished the page by adding some ink splatters with mister huey mist in gold, mary mary, navy, skyscraper and mistletoe . this noteworthy sights paper from bessie (add on 1) is one of my favourite this month. to start this layout, i used mister huey mist in mary mary, double yellow, seafoam and skyscraper to create ink splatters to highlight the circular design of this paper. I placed the photo in the middle and had fun arranging all the embellishments around it. 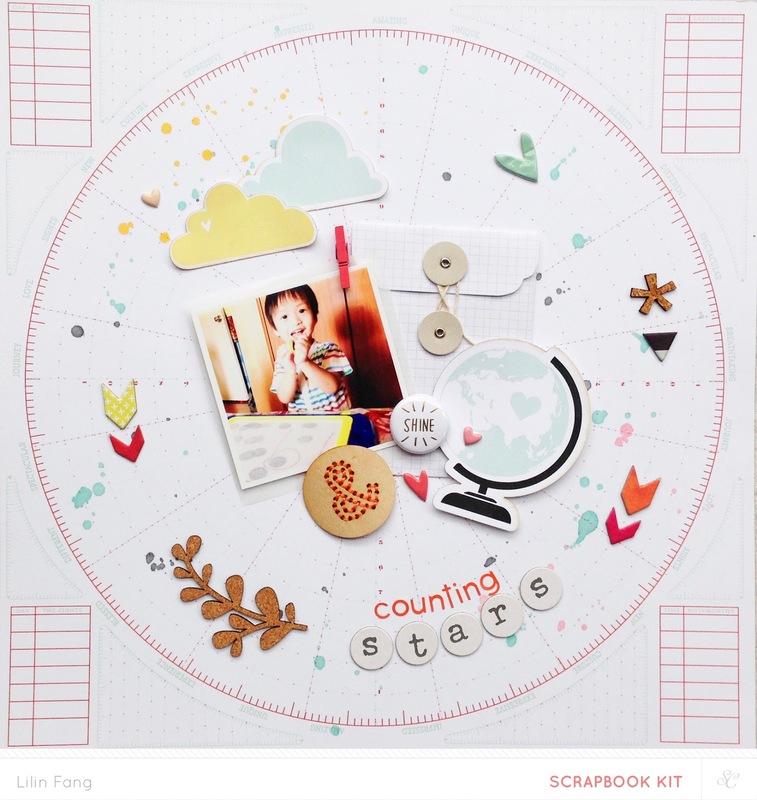 the inspiration for this layout is this dotted heart from the card kit digital stamp set. i used it to create a cut file and cut it with my silhouette cameo to create a mask. using the mask, i painted gesso on the black polka dot paper from clover (add on 2). to add some color, i used gelatos to fill up some of the circles. once my background is ready, i finished the layout by adding my photo, embellishments and added my title with a white crayon to create a chalkboard effect. i hope you enjoyed my reveal of bluegrass farm! remember subscribers can start shopping now, for the rest of the public, reveal will go live at midnight EST/ 11pm CST tonight and the links to bluegrass farm will not work till then.